The massive paddle-powered watercraft have a 2,500-year legacy going back to ancient China. Once used in ceremony and war, today’s dragon boats are built for speed and competition. Racing festivals have become popular around the globe. Spectating is one thing, but why not start a team of your own, or join an existing squad of like-minded adventurers and be a participant? One of the great things about the festival is the open opportunity to take up a paddle and row, row, row. Teams of 20 can register to compete. 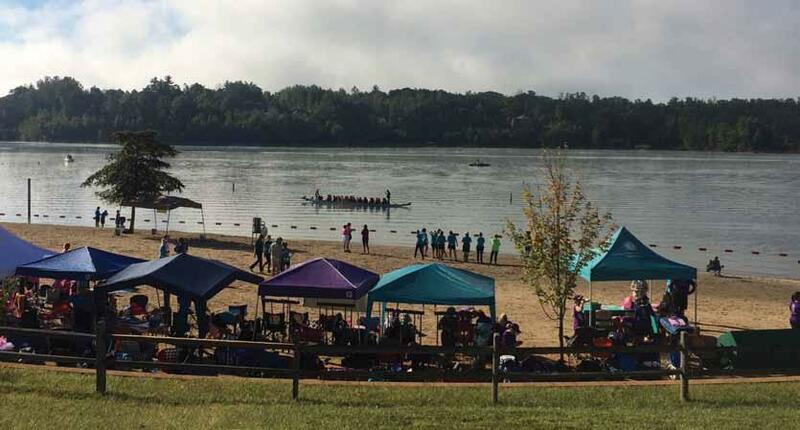 The Healing Dragons of Lake James will provide a dragon boat, paddles, life preservers, an experienced helmsman to steer the boat and a practice session to get you ready for the race. Registering a team is easy; just visit www.lakejamesdragonboat.com and sign up. There are no restrictions based on size, age, gender or experience. You can feel great about paying your registration fee too. Proceeds will be donated to Carolinas HealthCare System Blue Ridge Cancer Center’s patient service programs. Whether you choose to join the pageantry or enjoy the sights and sounds of the competition from dry land, do not miss this terrific event!